As I was shopping for my West Elm duvet, I came across quite a few similar duvet covers at drastically different prices and I wanted to share a few of them here. Granted, I'm sure the quality is also drastically different, but if your just going for the look, it might be worth trying out some cheaper options. All of the prices are for a Queen size bed. These two are pretty much the same. I'm sure the quality of the West Elm one is better, but I think that I would probably choose the Target duvet in this case. The price is too good. 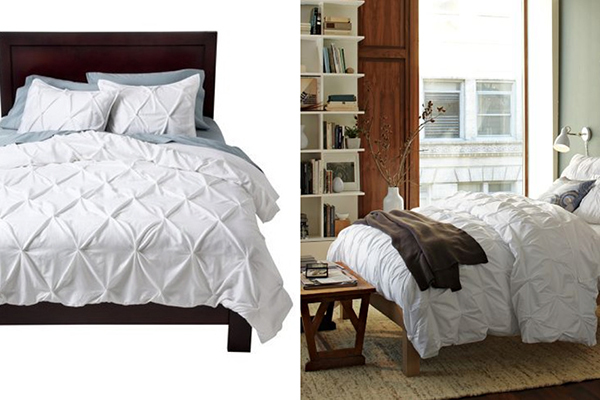 The Target duvet also comes in gray and pink. I love the painterly quality of both of these duvets. Although I prefer the the colors in the Anthropologie duvet, I prefer the pretty scene of Urban Outfitter's. I've been seeing scallops everywhere lately. Dwell's duvet has a lot more detail but I tend to prefer bright color, so in this case, I prefer the Urban Outfitter's one. So these aren't exactly the same, but both have asymmetrical squares that create texture. I guess this one would come down to which colors your preferred (I prefer Ikea's colors), but in terms of design I honestly like them pretty equally. What do you guys think? Would you go for the splurge or the steal?